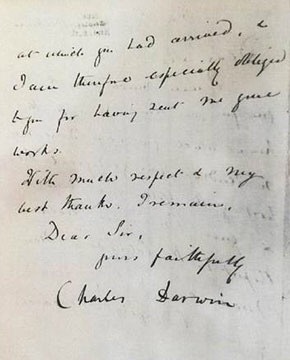 Special agents from the FBI returned a recovered Charles Darwin letter to the Smithsonian Institution Archives, the FBI Washington Field Office announced. The letter, penned by the renowned naturalist and geologist in 1875, was stolen from the Smithsonian more than three decades ago. It was recently recovered by the FBI following a public tip regarding the letter’s whereabouts. On May 26, 2016, Assistant Director in Charge Paul M. Abbate of the FBI Washington Field Office returned the letter to Smithsonian Institution Archives Director Anne Van Camp after an investigation by special agents from the FBI Art Crime Team. The letter was stolen from the Smithsonian Archives in the mid-1970s, shortly after the Archives received the Merrill Papers but before the letter could be inventoried.